There’s just no way around it. 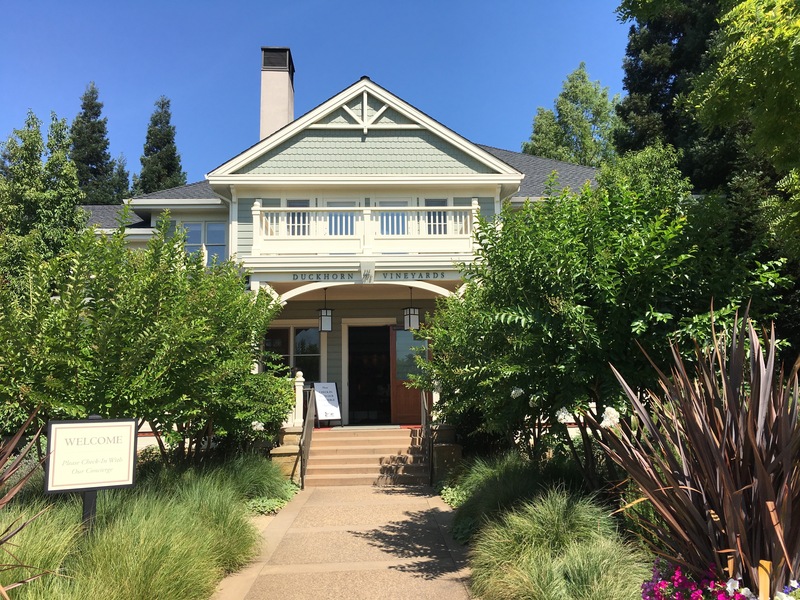 Duckhorn is one of our absolute favorite wineries, both for the tasting experience and of course for the wines. The winery itself looks like a turn-of-the-century residence that’s been converted into a charming bed and breakfast. Even the interior makes you feel right at home with domestic touches throughout and a floo powder worthy fireplace. Check in just inside the front door and a wine educator will happily seat you inside the lofty bar area or outside on the wrap around porch or semi-private redwood patio. We recommend making a reservation for a tasting. It can get busy on the weekends, and since it’s a sit-down affair you should plan to be there for an hour at least. We almost always taste outside to take advantage of the drought-tolerant gardens and the afternoon breeze that carries with it scents of lavender, rosemary, and lambs ear. The stay awhile tasting you experience is relaxed, self-paced and generous by any standard. You’ll taste a six-glass flight, with the possibility of an extra pour or two if you’re lucky. 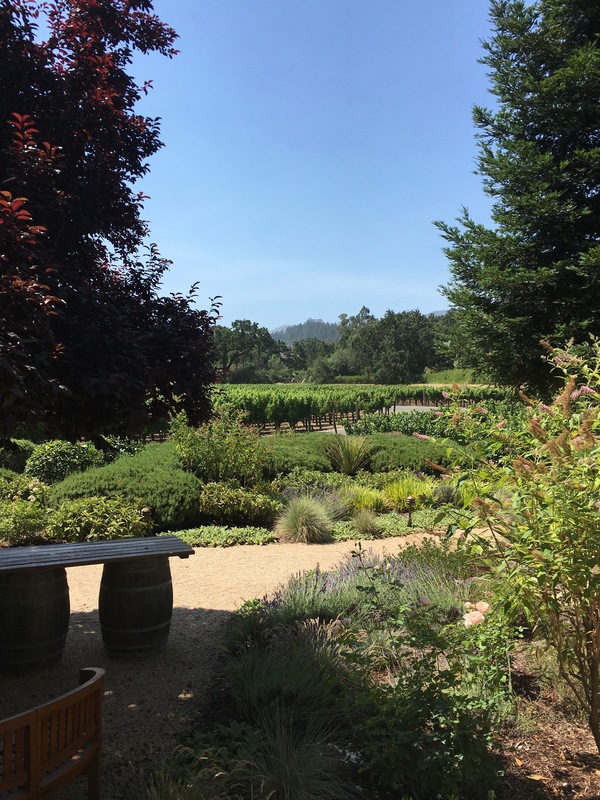 We enjoy most of the Duckhorn catalog but particularly liked the 2012 Rector Creek Merlot and the 2011 Monitor Ledge Cabernet Sauvignon we had on this visit. The Rector Creek combines worn saddle, wild berry, and black cherry flavors. The Monitor Ledge is more fruit forward with hints of raspberry, fig, and Saskatoon pie. The surprise of the day was the 2015 Sauvignon Blanc. More floral than vintages past, this wine carried flavors of baked pear and candied grapefruit with an undercurrent of ripe star fruit. Finally, there is nothing better than a glass of Discussion, Duckhorn’s premium blend. Trust us. It’s worth talking about! Duckhorn is most widely known for their merlot, in particular the Three Palms Merlot that’s harvested from the northern vineyard with the trio of classic palms trees in the center. It’s easy to spot from Silverado Trail if you’d ever like to take a look. Our host shared with us that a master sommelier recently told Duckhorn staff that the Three Palms vineyard is the best location in the world for growing merlot. A visit to Duckhorn Vineyards should be at the top of your list the next time you venture into Napa Valley. Save a seat for us! Tip: Don’t plan on Duckhorn being your last stop of the day. They’re only open between 10am and 4pm.